With space for building at a premium there has been an increase in townhouses being built with tiny gardens, to maximise the number of properties on a plot. Despite their small size these gardens have an important place in townhouse living. Of course owners want to make the most of the small back yard space they have but added to that is the need for the garden to look great when viewed from first floor balconies and living spaces.Here at Gardner’s Gardens we have become quite expert in townhouse gardens over the last few years and pride ourselves in being able to tackle the unique problems faced in this environment come up with unique, innovative and stylish solutions. This is an example of a townhouse in Cambourne near to Cambridge, England. It is an odd shaped plot and was in a bit of a mess. The owners have two dogs that like to dig and as they are both hard working professionals they wanted maximum impact and minimal maintenance. The materials used are Ipe decking, white granite and torched black granite. The false pergolas around the perimeter add height to the garden and soften the intrusive impact of the surrounding homes. 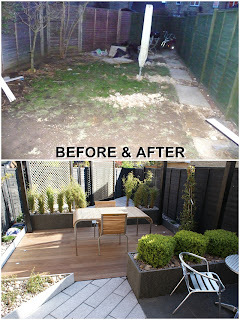 Contact us about transforming your own garden into a space to be proud of. Please use the form on the right.